STELLAAAAAAAAAAA! Before last night, that’s pretty much all I knew about Tennessee Williams’ play A Streetcar Named Desire. But now I know what a fascinating, entertaining, tortured tale it is. I saw it last night as the final show of the 2009-2010 season in the Wurtele Thrust Stage at the Guthrie Theater (the final show in the McGuire Proscenium Stage is Scottsboro Boys, which I’ll see in a few weeks). As usual at the Guthrie, it was an amazing production. Blanche DuBois has got to be one of the greatest characters in the history of American theater. Think Scarlet O’Hara, only without the “I’ll never go hungry again” strength. Blanche and her sister Stella were raised on a beautiful old Southern plantation to live a certain kind of lifestyle. That lifestyle has fallen apart, and Stella is now married to the abusive Stanley, living in a run-down house in New Orleans, and Blanche has gone from man to man, looking for someone to take care of her. She was raised to be the wife of a gentleman and mistress of a household, and doesn’t know how else to get through life. She’s still haunted by the tragic ending of her early marriage, which is beautifully illustrated by the sound and lighting in the play. At times you feel like you’re inside Blanche’s head, and it’s not a comfortable place to be! 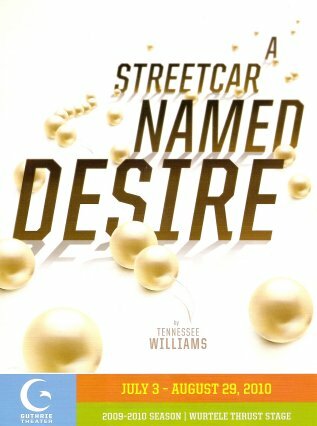 The story begins when Blanche comes to New Orleans to visit her sister (and takes a streetcar named, yes, Desire, to get there). She meets Stella’s husband Stanley, a brute of a man, verbally and physically abusive toward his wife. But he has that charm and passion (e.g., “Stellaaaa!”) that, like most abusive relationships, keeps Stella coming back to him. Stanley and Blanche do not get along, and when Blanche overstays her welcome and Stanley discovers the truth about her past and why she’s there, he uses it against her. Her fragile world comes tumbling down. The all-around solid cast features Guthrie regular Stacia Rice as Stella Kowalski, Guthrie newcomer Gretchen Egolf as Blanche DuBois, and 1999 graduate from A Guthrie Experience for Actors in Training, Ricardo Antonio Chavira (Carlos from Desperate Housewives), as Stanley Kowalski. Gretchen beautifully portrays Blanche’s charm and wit that's covering for a person on the edge of falling apart, and who eventually steps over that edge. I felt the most sympathy for Blanche in this play. Sure she’s made some poor choices in her life, but she’s just doing what she knows and trying to find someone who will love her and take care of her. As her suitor Mitch (Brian Keane) tells her at one point, “You need somebody. And I need somebody, too. Could it be - you and me, Blanche?” I really wanted that to happen for her, for both of them, even as I knew it wouldn’t. Other notable members of the cast are frequent musical theater performer Ann Michels, and my “costar” and one of my favorite local actors, Raye Birk. For those of you who don’t know, I also have a burgeoning career as a movie extra – catch me at minute 56 of the Coen Brothers’ 2009 film A Serious Man. Raye plays the doctor in the film, and even though my scene was not with him, I consider him my costar. ;-). Another digression: several weeks ago I saw Stacia and Ann in the audience of Circle Mirror Transformation in the Dowling Studio at the Guthrie; I think they were just beginning rehearsals at the time. The play was a really funny and touching look at a community acting class and the lives and relationships of the participants. A show about actors must draw actors, because I also saw Randy Reyes (Song in the Guthrie’s recent production of M Butterfly) in the audience. I’ll close this first “review” on Cherry and Spoon with some memorable quotes from the show. Even though I’ve never seen the play before, some of them were familiar to me because it’s become a part of our culture. that sounds wonderful, jill. I love all of Tennessee Williams' plays and I just know that the Guthrie knows how to do his plays right. Is that the playbill from the show? it sure is, kendra. since i collect playbills and think they can be quite interesting and beautiful, i thought i'd share them with my readers.